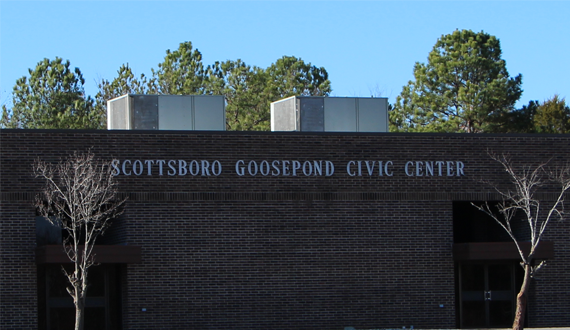 Quick info about the Scottsboro Civic Center located in Goosepond. Located in the heart of Jackson County, at the city owned lake resort, the 17,000 square-foot building can accomodate 512 people for formal dining or a total capacity of 825. The Civic Center is easy to access and also has ample parking. The Center is perfect for formal or banquet style dining. The beautifully decorated facility will make your special event a memorable one. The Scottsboro Goosepond Civic Center stage can accommodate your party's guest speaker, concert performances or any cultural event. Within easy driving distance from Huntsville, Birmingham, Chattanooga and Atlanta, the Scottsboro Goosepond Civic Center is the perfect location for trade shows of all sizes. The Civic Center is just one of the many attractions that can be found at the Goosepond Colony Resort Complex. Goosepond offers two beautifully appointed, challenging 18-hole golf courses, a full service marina, campground, amphitheater, five miles of walking trails and plenty of lodging. Want to see the layout of our Civic Center?